The author seeks to immortalize Southern Indiana’s pioneer past through a historical fiction novel. Hugo C. Songer channels his passion for Southern Indiana’s pioneer past in three ways. 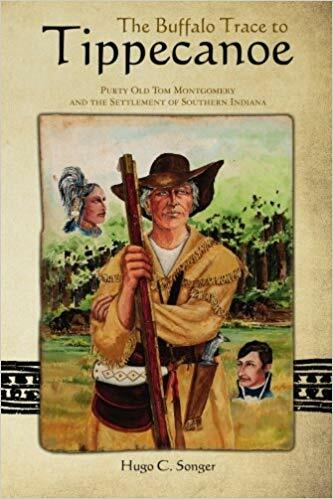 He collects Indian artifacts, pioneer materials, and books about pioneer history; lives in a log cabin home with his wife; and published his first novel, “The Buffalo Trace to Tippecanoe: Purty Old Tom Montgomery and the Settlement of Southern Indiana” (BookSurge, 2010). The novel, which features real-life characters, depicts the earliest days of the Indiana territory. The protagonist of the story is Purty Tom Montgomery, who travels alone deep into unfamiliar territory in search of a new home for his family, which consists of his seven adult children and their families. Already close to 60 years old at the time, Montgomery embarks on this solo, dangerous trip through Indiana territory and meets several important figures from Indiana’s pioneer history. As the Montgomery family travels to and settles into their new home, they have to encounter wild animals, vicious settlers, hostile Indians, and storms. The author strives to present a balance point of view in “The Buffalo Trace to Tippecanoe” as the narrative takes place during the slavery period and the hostilities between the Indians and the settlers, many of whom came from Europe. The novel also depicts the Battle of Tippecanoe, which resulted in a victory over the Indians by American forces and Montgomery’s increasing understanding of the Indians. Watch out for the public display of this engaging historical fiction at the upcoming Los Angeles Times Festival of Books on April 13-14, 2019 at the University of Southern California in Los Angeles, CA.